Berlin is the capital and the largest city of Germany with a population of 3.4 million people. Berlin is influenced by a temperate seasonal climate, and around one third of the city's territory is composed of forests, parks, gardens, rivers and lakes. The city itself is in a transition because of its tremendous population loss after 1940. Today, Berlin is characterized by simultaneous urban growth and shrinkage (of population), residential vacancy on the one hand, famous (re)construction sites on the other. Next to built-up residential (25%), transport and commercial land use, forests, parks and wooden areas >40% a dominant land use which makes Berlin’s city area special and worthwhile for investigating biodiversity and ecosystems. 25% of the area is covered by arable land. Future scenarios for Berlin are primarily driven by global climate change, change in world markets and of the finance sector. Internal drivers such as demographic change and ageing, land use perforation, increase of urban brownfields and inner-urban reurbanisation affect the city region. In terms of ecosystem functions and services, Berlin will be affected by climate change and heat waves (several times in the last decade), increase of poverty and environmental injustice. In the Berlin case study, the objectives were to i) compute general ecsosystem services at the city level and work on their valuation, and ii) Raise stakeholders’ awareness about these ecosystem services and co-develop scenarios of urban planning changes and related impacts on the delivery of ecosystem services. 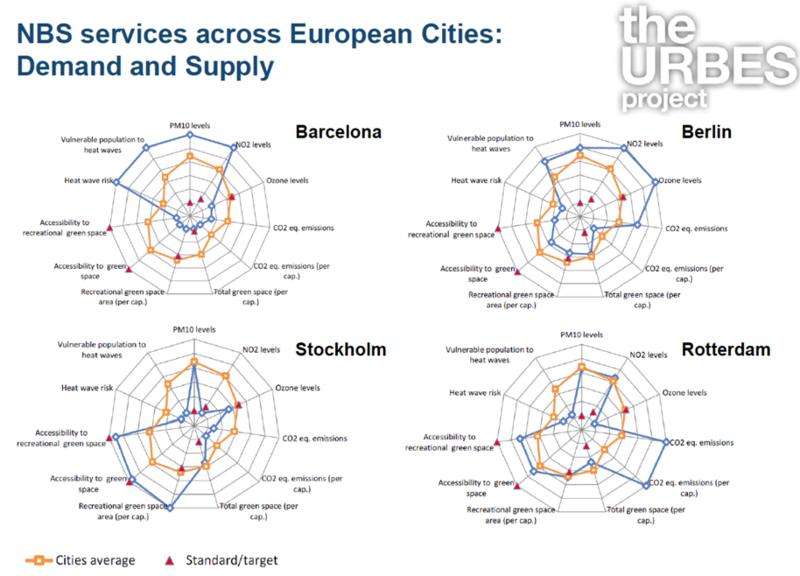 - A quantification of ecosystem services demand and supply in 4 cities including Berlin was published by the URBES project (see Baro et al. 2015). Ecosystem services include air purification, global climate and urban temperature regulation. - Analysis of ecosystem services implementation and related governance challenges in green space planning (see Kabisch 2015): Based on an analysis of strategic planning documents and expert interviews with local stakeholders, this work explores to what degree the ecosystem service framework is integrated in the planning system and iden-tifies major challenges in urban green governance. As an output of the analysis of planning documents,it is identified that only very recently developed informal strategies explicitly relate to the ecosystemservice framework although stakeholders are aware of the term. Identified main challenges in Berlin’surban green governance include (a) increasing development pressure from population growth and finan-cial constraints on the municipal budget, (b) loss of expertise and (c) low awareness of green benefitsamong different actors through insufficient communication. The concept of ecosystem services, how-ever, may provide a useful argument to promote the conservation of existing urban green spaces and tocommunicate the benefits that urban nature provides for citizens to all levels of green space governance. The results were built and analysed with stakeholders of the project, and the participatory scenario development exercise allowed transferring results on the impact of different urban planning change on the delivery of ecosystem services at the city level. The results are generally transferable for urban planning, although specific to Berlin and tailored according to local development plans and land use. Nonetheless this research is part of the URBES project, with related case studies in 7 European countries. Accessibility and availability of green space is found more important than its relative size. The structure and key features of urban green space, rather than e.g. size per capita, are more effective measures of the delivery of ecosystem services, especially related to public health and human well being.